Although I have public speaking experience as a former teacher and even in social media circles, this past weekend was my very first WordCamp talk. And, just to add extra pressure, it was a keynote. So, what did I learn? On July 30, I was surprised to get a Twitter DM from this year’s WordCamp Cincinnati lead organizer, Janette Dywasuk O’Shaughnessy. I was totally surprised but I asked her to send me more details to my email, where we had further discussions. When I told the guys at WordImpress, they were all in! My friend Kevin Hoffman reminded me that the difference at a WordCamp is in fact the culture. Everyone at a WordCamp is a champion of everyone else. They are in the audience and they’re rooting for you to succeed. Remember everyone in the audience wants you to succeed. That was something that struck me about WordCamp. You'll be great. Not only that, but the day of the talk I got so many text messages, messages on Facebook, and public tweets of support. Remember, this is the WordPress Community. If there’s one thing they know, it’s being supportive. I tweeted out an ask for advice about slides and Janette Dywasuk O’Shaughnessy told me to speak from my heart. It’s true! We forget that we’ve been selected because we know our subject. Prepare, yes. But also, our talk is in us. It is us. We can do it. You can do it. Slides can be a real challenge, especially if you’re a new to speaking with slides. Personally, I think slides are distracting, but it’s expected. So, you have to do it. So I started with a Google Doc outline. This helped me know what slides to even create in the first place. I made my slides on Canva.com in a way that matches my personal branding for BridgetWillard.com. Slides should support the words you’re speaking and help pace you through the presentation but they shouldn’t be the exact words you’re speaking. Also, you may want to check on the slide ratio of the venue. I didn’t, but I was okay with black sidebars. No seriously. Practice. Muscle memory is real. I am auditory so when I write, I’m really hearing myself speak in my mind. And I knew what I was going to say but I still wanted to make sure I had enough content and that it wasn’t awkward. So when I say you should practice, I mean stand up, look out at the crowd, change your slides, and time your talk. More than once. In my case, Jen Miller called me and kept checking on my progress. On Thursday afternoon she basically said, let’s FaceTime — now. After a rehearsal and feedback, we did it one more time. That was the trick. Test all adaptors. Use Apple Approved if on Mac/iPad. The organizing team chose you and your talk for a reason. They’ve also been prepared to put on this camp. If you have questions ask. So my very first WordCamp talk is in this huge theatre. In my case, the speaker wrangler, Aaron did a great job sending us A/V requirements and other info. Also, Janette did a great job calming me down before the talk with great tips like when in doubt slow down, take a sip of water, and remember, we’re having fun. I was a bit surprised at the effect my presentation had on people. Dozens of people came up to chat with me afterward, recounting how part of my story aligned with theirs — death in the family, second career, caretaking for someone on dialysis. Be intentional with your audience. Take the time to hear their stories. Thank them for being brave. It’s hard to talk to others. If they tweeted you, reply with a word of thanks. Retweeting isn’t enough, in my opinion. Be kind. Remember, the audience gave you the gift of their time and attention. That’s not something that should be taken for granted. 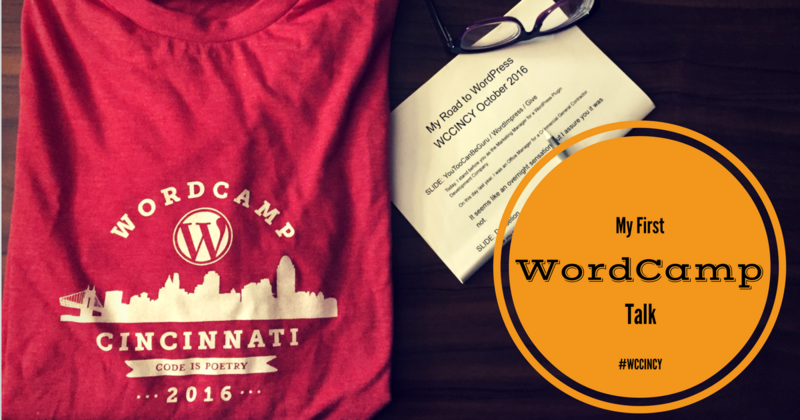 How do you prepare for a WordCamp talk? What are some of your success stories? How can we learn from you? Tell us in the comments.